Ashlea was inspired to become an instructor in order to inspire others to practice. 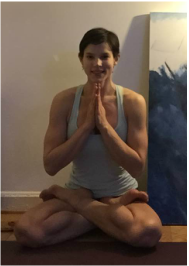 Before becoming a yoga instructor, Ashlea trained as ballet dancer for 15 years at institutions including The Nutmeg Conservatory for the Arts, Central Pennsylvania Youth Ballet, The Joffrey School of Ballet, The Rock School of Ballet, and the Baltimore School for the Arts. Ashlea discovered her love for yoga while taking hot yoga classes during winter and summer breaks from college. Shortly after graduating, she spent 8 months in yoga teacher training. Her classes focus on the convergence of body and mind, with a concentration on alignment. As a practitioner of Ashtanga Mysore, Ashlea believes in inspiring each student to do their practice. Using repetition as a medium for reflection, the physicality of Ashlea's class provides a mirror though which you can view the inner-self, as you are, on and off the mat.